In-Cosmetics Global, the leading event in the cosmetic industry, provides an excellent opportunity to suppliers of personal care ingredients to present their latest research and launch new active ingredients. As anti-pollution ingredients are a rising trend this year, Karl Lintner organized a workshop on « The pollution story: really a new trend? ». 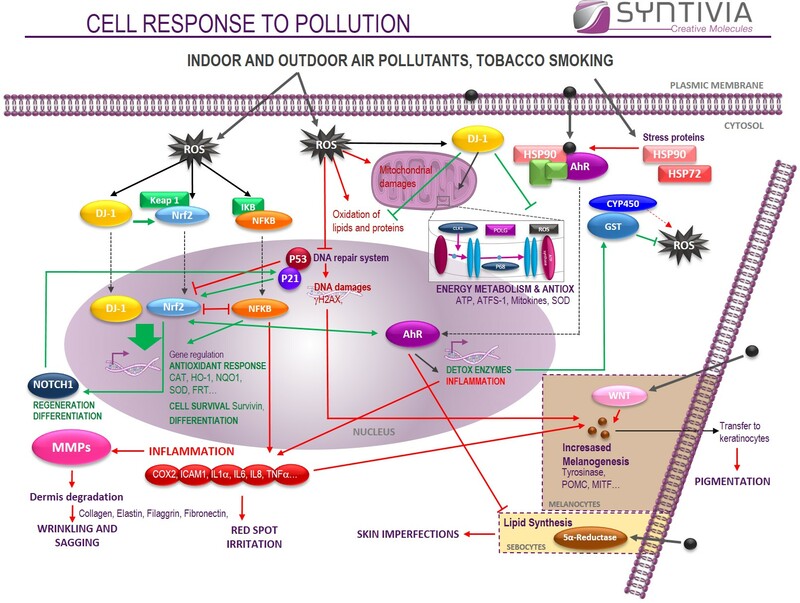 The workshop was dedicated to the current position of anti-pollution cosmetic active ingredients and products and a welcome occasion for Syntivia to explain how to evaluate anti-pollution claims in vitro and ex vivo. Urban pollution is recognized by the World Health Organization as the most important environmental issue in the world. Over 99% of the urban population in China, India and Pakistan is regularly exposed to concentrations of air pollutants that exceed the recommended level. The population in Europe, USA and the rest of the world are now also facing increasing exposure (Euromonitor International, Natural Resources). The anti-pollution trend started in Asia some 10 years ago and gained momentum over the past 3 years. Between 2011 and 2013, the number of antipollution cosmetics increased by 40% (Mintel). In 2015, antipollution cosmetics represented a market share of 28% in the Asia-Pacific region. One year later, this number reached 38% (Les Echos). In 2016, anti-pollution cosmetics accounted for 1% of newly launched beauty products worldwide (Mintel). Today, the trend also reaches big European and American cities, which now also face regular pollution peaks. Western consumers are increasingly turning towards cosmetics to not only stop the signs of aging but also to protect against pollutants. Consumers have become increasingly aware of the effects of air pollution on their skin, which stimulates the demand for products that counter this phenomenon and contribute to a healthy appearance. Atmospheric pollution, combined with ozone and UV-rays, disrupts the existing balance between production and elimination of reactive oxygen species (ROS) and induces inflammatory response. 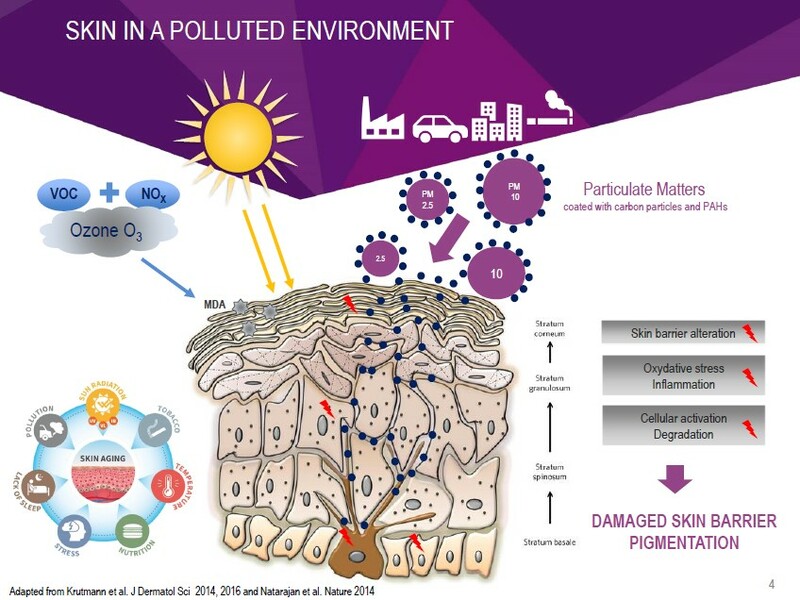 Chronic stress induced by atmospheric pollution impacts and alters the integrity of the skin barrier to such an extent that it can generate or worsen certain pathologies (sensitivity, irritability, dehydration, pigmentation disorders, dermatitis). Particulate Matters carry a range of toxic chemical molecules, such as Polycyclic Aromatic Hydrocarbons (PAHs). Upon contact with the skin, these molecules release toxic compounds that may damage the skin on a deeper level. Most of the players in the cosmetic industry have started to address the pollution issue. Demand for products that can protect the skin from pollution is on the rise and there is no doubt that this trend will continue in the future. Karl Lintner’s workshop, »The pollution story: really a new trend? », provided an overview of existing products and needs in order to address the demand for anti-pollution products. To evaluate a product’s anti-pollution properties, in vitro testing is essential: it allows to prove a product’s efficacy and its impact on the skin’s biological mechanisms in order to document anti-pollution claims. Our Biology and Marketing Manager, Dr. Claire Leduc, presented Syntivia’s approach in measuring anti-pollution claims in vitro and ex vivo. 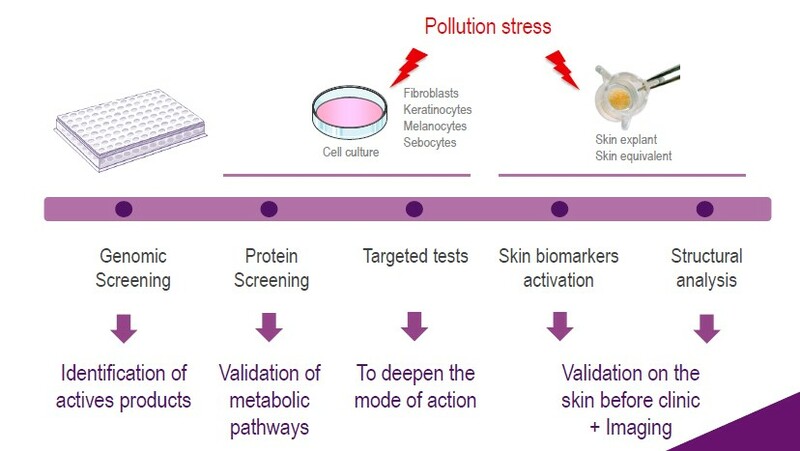 The goal of this presentation was to give a detailed overview of the different methods available to evaluate anti-pollutants (from molecules to cosmetic formulas), the skin models that can be used (from cells to skin explants) and the different ways to generate pollution stress (from noxious gases to microparticles and others). The choice of test model depends on the ingredient’s mechanism of action. It’s possible to work on cell cultures but skin explants or skin equivalents can also prove useful. In vitro tests are essential tools to demonstrate the activity of new cosmetic ingredients and products. These tests need to be organized in well-designed studies to fully prove the efficacy of the molecules to the professional community. Marketing arguments need to be based on solid knowledge, rigorous testing and reliable results to support anti-pollution claims. Genomic screening is the first step to identify the most active compounds able to modulate the genes implicated in a cell’s response to pollution. This step can be carried out on skin cells as well as on skin tissue (explants or 3D equivalent models) to highlight the metabolic pathways activated by the product. To validate the activation of anti-pollution defense strategies, we screen skin cell proteins using a wide range of biomarkers in order to cover all the different actors of a single metabolic pathway. The product’s protective effect is then tested using more targeted tests to investigate its precise method of action to document the anti-pollution claim (example below). Every day, we increase our understanding of skin response to pollution. The cosmetic industry hasn’t yet established any standards to demonstrate the effects of anti-pollution cosmetic ingredients. Indeed, currently, there are no standard tests or calculation methods to define a “Pollution Protection Factor”, contrary to the existing system for solar protection products (Sun Protection Factor). This may be an asset for the cosmetic market but it also represents a challenge, as research in this field requires constant innovation. Today, companies are at liberty to design their own anti-pollution tests to provide evidence for the activity of their product and find the best way to demonstrate its interest to consumers. As Syntivia is an external laboratory, we help our customers cover all the phases of their research and development programs. It’s scientifically exciting for our research team to find new targets and identify metabolic pathways in order to demonstrate anti-pollution claims in vitro. In the future, new targets will be defined in order to have a broader spectrum of biomarkers to support this claim. Syntivia is currently working on the development of new test models to demonstrate the anti-pollution effect of cosmetic ingredients and products. Don’t hesitate to contact us for more information.